The GDA is always working to improve our neighborhood and quality of life. Check out some of our recent and ongoing projects below. If you have an idea for a community project, please let us hear from you via email to gardendistrictno@bellsouth.net. On August 1st, 2010 the GDA Grafitti Abatement program went into full force. Studies show that neighborhoods with graffiti are more attractive to the criminal element of the city. We intend for that not to be the the story for the Garden District so the GDA has taken action by employing a non-profit organization called Operation Clean Sweep (OCS) to address the issue. OCS canvasses the neighborhood to identify graffiti tags, then contacts the property owner to receive permission to remove the violation. If the tag is on city property, CS works with the city in removing the problem as well. In addition, OCS helps to identify the perpetrators and works with the NOPD to bring them to justice. If the graffiti can be safely removed with special solvents, this method will be used. If not, property owners will be asked to supply the paint to cover the markings. Removal of graffiti tags is free to the property owner under this GDA program. According to City Ordinance #19086, any property owner who leaves graffiti on their property for more than 30 days shall be subject to a $500 fine. All property owners are free to remove the tag on their own, but must do it within 30 days or be subject to the city’s fine. To report a graffiti tag: please send us an email with the exact location and a photo, if possible, or simple call directly to the Graffiti Hotline: 486-9694. We hope that this program will take us one step closer to keeping our neighborhood beautiful and safe. We encourage your participation. 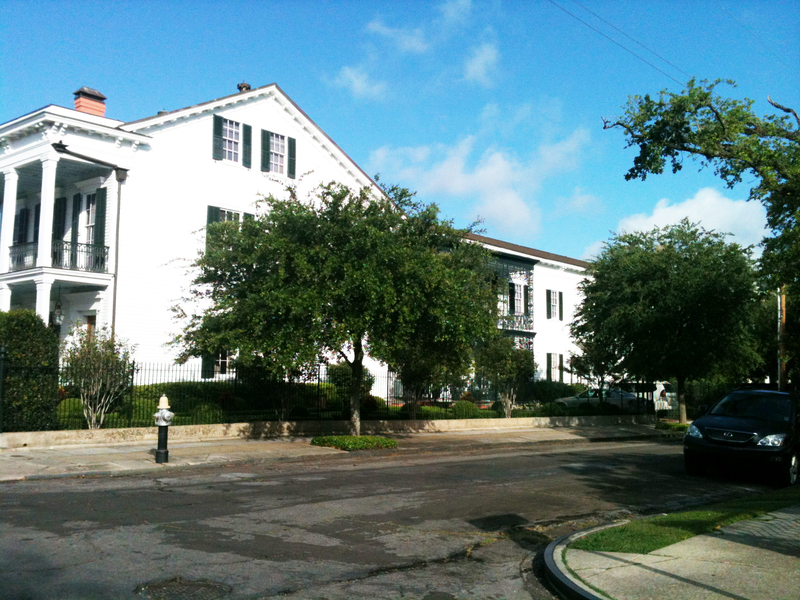 The Garden District Association took on another beautification project in 2010: the replanting of Jackson Avenue neutral grounds. 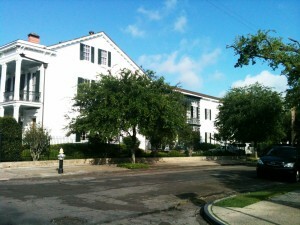 The Crepe Myrtles that lined the avenue, most of which were in decline, were replaced in 2010 replaced with Holly trees. Over the past several decades, many of the trees planted in the median were damaged by the busy traffic , their canopies destroyed by passing trucks and their demise hurried by lack of proper pruning. Because of its narrow 5 foot width, the selection of trees appropriate for this site was limited. This project was approved by the City of New Orleans Department of Parks and Parkways and the new plantings will be pruned and maintained as needed, in coordination with the Department of Parks and Parkways. In addition to the underwriting part of the St. Charles Avenue Planting Project, the GDA continues our own Enhancing the Canopy of Oaks program for oak tree plantings throughout the neighborhood. Appropriate planting locations usually require a space of 3ft. x 5ft on public property (often between the sidewalk and the curb) which cannot be located under electrical wires. Property owners who choose to participate pay only 1/3 of the cost of each oak tree and will benefit from the service of professional landscapers. The remaining 2/3 of this cost will be paid for by the Garden District Association and our very generous neighbors, Tony & Katherine Gelderman. If you are interested in planting one or more trees near your property, please contact the GDA at 525-7608 or gardendistrictno@bellsouth.net. The GDA Beautification Committee, with matching donations from neighbors Tony & Katherine Gelderman, approved support for 25 oak trees to be planted along St. Charles Avenue between Jackson & Louisiana Avenues in 2010. This planting was done in cooperation with the St. Charles Avenue Planting Project spearheaded by local attorney and community activist Ted Le Clercq. Since the project’s creation in 2008, Phase I succeeded in planting 120 oaks between Lee Circle and Jackson Avenue. The group’s ultimate goal was to plant 125 oaks along the remainder of St. Charles Avenue, and continue down Carrollton Avenue was met through donations of many individual and corporations who understand the importance of the Avenue. This great project ensured that St. Charles Avenue continues to be one of the premier boulevards in the nation. We were proud to participate.